The Last Days on Mars – Life after all? A group of astronauts on their last days on Mars discover the answer to age old question “is their Life on Mars?” with terrifying consequences. Although based on Sydney J. Bounds short story writer Clive Dawson debatably borrows the most interesting parts of Red Planet (2000), The Thing (1982), Prometheus (2012) and Mission to Mars (2000). Director Ruairi Robinson offers realistic and impressive visuals, this isn’t your low budget Stranded (2013) or Apollo 18 (2011). Robinson’s sci-fi chiller is unavoidably reminiscent of Alien (1979) as the crew are picked off one by one, and Prometheus with it’s infection aspect and 28 Days Later (2002) ‘rage’ thrown if for good measure. However it’s so well executed it has it’s own identity, whereas the likes of some of the aforementioned and for example Sunshine (2007), Event Horizon (1997) or Pandorum (2009) to name a few had good ideas they arguably never managed to fully satisfy in every act. 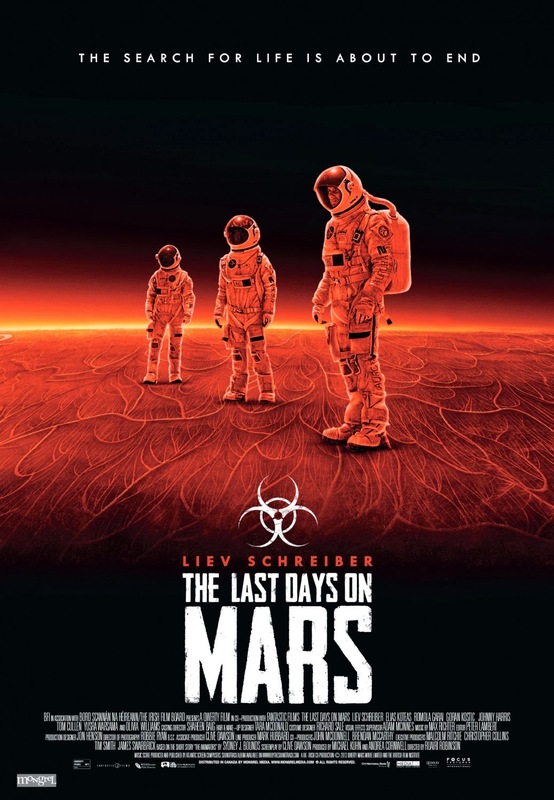 Here The Last Days on Mars doesn’t pretend to be anything its not – delivering mainly due to it’s simplistic yet interesting survival story, packed with horror visuals and silhouettes coming out from the shadows of the space compounds, through martian dust storms and chases from A to B. The small cast ensemble including the excellent Liev Schreiber and Elias Koteas are on form, notable is Olivia Williams as the competitive science officer and Romola Garai gives much of the emotion. Both Goran Kostic as Marko and Tom Cullen are particularly memorable. With great costumes and set design the makeup and special effects are first rate, the martian location, space vehicles and compounds are wonderfully realized. It’s bloody and gory in places, the virus zombie like infection is unnerving. Robinson creates some real suspense, tension and atmosphere in amongst the frantic horror set ups. To its credit both Dawson and Robinson are not afraid to give a bleak and ambiguous closing and while many of the elements have been seen before The Last Days on Mars refines them into a film that does what it says on the tin and delivers some serious dark space horror entertainment. Recommended.